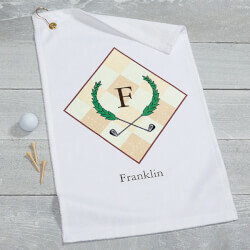 Our Golf Pro Personalized Golf Towel features any initial and last name custom personalized within our handsome golf crest and argyle design, calling it theirs alone! An essential accessory for every golfer from amateur to pro! Makes a great gift for birthdays, Father's Day, retirement...even that bachelor party "last round"! 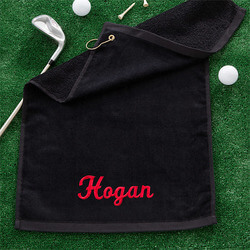 Black Personalized Golf Towel With..